Whether you are a business owner, manager, or on the production floor, workplace safety should be top-of-mind. According to the 2018 Liberty Mutual Workplace Safety Index, overexertion is the leading cause of disabling workplace injuries. It costs businesses over 13 billion dollars annually and accounts for nearly 25% of the overall national burden. That’s 1 out of every 4 injuries leading to missed work caused by lifting heavy items. Weight isn’t the only issue, however. Lifting awkward sized and shaped objects can make even lighter items a risk to move. In any labor-intensive industry, employers are cautious about the risks of workplace injury. Not only can workplace injuries cause physical, financial, and emotional distress for workers and their families, it also impacts a businesses’ bottom line. How Can Business Leaders Help? There are policies companies can put in place to reduce injuries due to material handling. One such way is by educating employees on the proper way to lift heavier materials and how they need to be placed at the “power zone” height, around mid-thigh to mid-chest. Special attention should be taken to ensure proper lifting principles are utilized to ensure safety. For materials over 50 pounds, companies can put in place a policy that requires partner-lifting. While all companies should have guidelines like this in place, in a fast-paced work environment, even with constant reminders, many employees will forget to follow these proper lifting principals. Business owners that take steps to protect their workers from dangerous activities will see the benefits in the reduction of workplace injuries, time off related to these injuries, and an overall safer work environment. 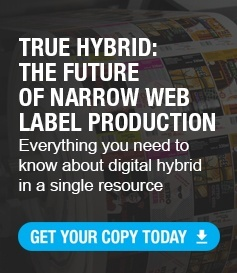 In the pressroom, material handling is a critical function to your workflow efficiency. One of the biggest struggles in a pressroom is getting large rolls on and off press once they are printed. 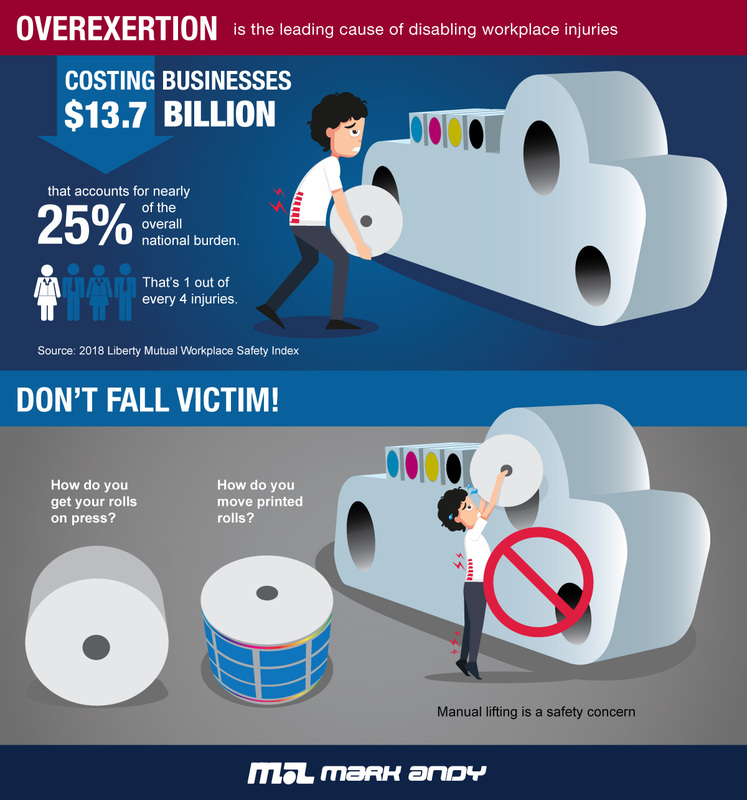 Improper lifting of rolls and dies can be an expensive mistake. Mechanical tools, along with enhanced workplace safety policies, are a major part of making your production environment safer. These machines are created specifically to increase workplace safety and reduce the risk of improper handling of heavy materials. Alongside a proper heavy lifting policy, mechanical tools are one of the top recommendations from the Occupational Safety & Health Administration, OSHA, in reducing workplace injuries due to overexertion. 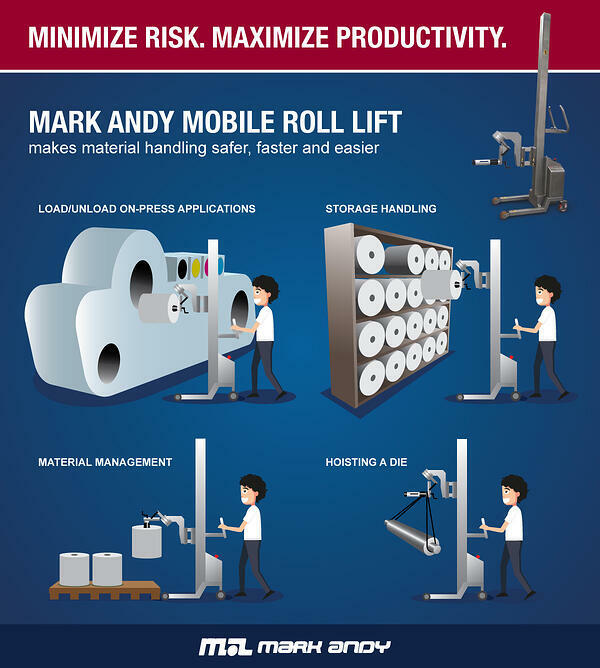 Mark Andy Print Products offers a Mobile Roll Lift equipped to solve the safety concerns associated with material handling. (You can view the Mark Andy Mobile Roll Lift in action here.) The mobile roll lift is easy for operators to use, makes changeovers faster, and increases overall productivity. The compact, battery-powered stainless steel design provides a solution for heavy cumbersome lifting, handling, and rotating raw material, finished rolls, dies and laminate rolls. It’s ideal for loading and unloading on-press applications, storage handling, material management, and hoisting heavy dies into place. We offer various models to accommodate different weight capacities and can be customized to include specific attachments to meet your business needs.